There are good records you only listen to once or two times. And there are good records you listen to again and again: in the morning, in the evening, in your car, when you feel good, when you feel bad. In the latter category stands Give Me Your Love, an absolute classic produced by Roy Ayers for his chorist Sylvia Striplin with nice strings arrangement thanks to William Allen. Roy occupied only the producing seat here and doesn't play any vibes but it's probably one of the best records he ever made. 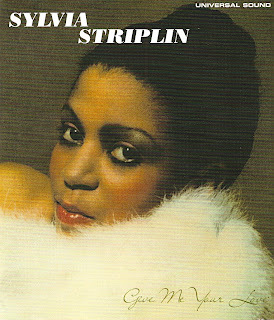 There are absolutely no filler and hip hop heads will recognise easily the melody of You Can't Turn Me Away and Give Me Your Love, two songs largely sampled or covered (http://www.whosampled.com/sampled/Sylvia%20Striplin/). A must have nicely repressed by Soul Jazz Records in 2010.